In stock - low quantity. Order in the next 13 hours, 38 minutes and it will go out today! A classic accessory for the working magician, the fake lemon. 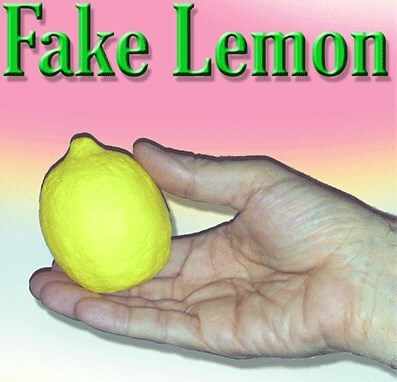 This particular fake lemon is made of one-colour PVC, meaning it is not painted, and as it doesn't contain latex is not affected by heat in the same way. 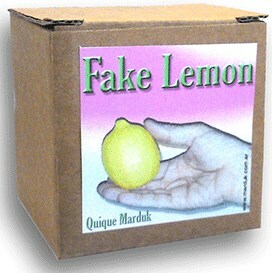 The possibilities are endless with the fake lemon, allowing both magical effects and gags. For example, you can perform the vanishing lemon by placing it into a paper bag and then crushing it. You can use it for the well known 'Orange, Lemon, Egg & Canary' trick, as well as many other effects. Top tip: check out 'Watch the lemon' from the Tarbell Course in Magic - Volume 5, page 75 - a wonderful parlour trick by Bert Douglas.